Eddie Izzard as Anthony and Larry Mills as Goose. A terrified six-year-old girl called Milly stands shaking in her pyjamas in the middle of a frozen canal. As a fireman makes a desperate attempt to save her from the cracking ice. 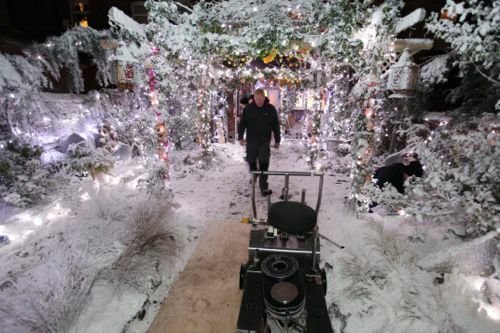 It’s a heart-stopping, shocking and haunting scene in Lost Christmas, to be screened on BBC1 this Sunday (Dec 18). A sometimes bleak 90-minute film that defies the sentiment of so many festive tales and shows a family audience that bad things can happen. That mums and dads and children die. But also that there may be second chances for those who have lost and are left behind. Many audience members were in tears as the end credits rolled after the film’s premiere at the British Film Institute in London yesterday. Agreeing that this was a marvellous story destined to be told for years to come. 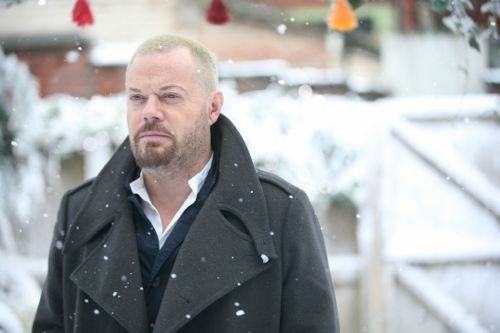 Larry Mills plays a boy known as Goose with Eddie Izzard as Anthony, a man with no memory of who he really is. Lost Christmas is one of CBBC’s most expensive productions to date – a co-commission with BBC1 – and may surprise some viewers. “But there’s something about Christmas with Scrooge, with Dickens, with Oliver Twist – the kind of stories that people accept and expect at Christmas. The drama broadcasts on BBC1 between 5:30pm and 7pm on Sunday and will be shown on CBBC at the same time on Christmas Eve, with some edits for language and content. Director John Hay co-wrote the screenplay with David Logan. John told how Lost Christmas was inspired by classic festive films and songs, including Fairytale of New York by The Pogues and Kirsty MacColl. “This is a sort of Fairytale of New Manchester,” he explained. There’s Only One Jimmy Grimble director John usually auditions thousands of child actors before he makes a choice. But he was so impressed with Larry, now aged 11, that he saw no-one else for this project. Even more remarkable considering this is Larry’s first major film role. 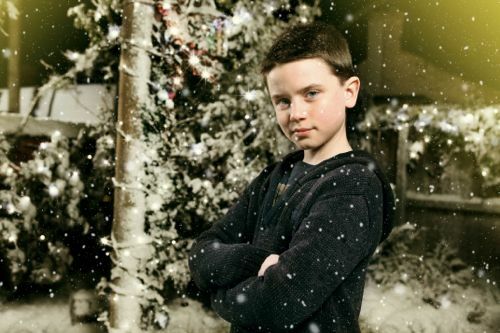 Lost Christmas begins “Last Christmas Eve” when we meet Goose and his family. Before too long we also encounter Anthony, lying flat on his back on inner city cobbles. “Everybody’s lost something,” he says. 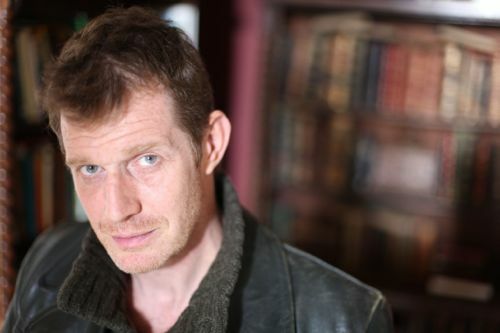 Including Frank (Jason Flemyng), estranged from his wife and daughter and seeking solace in booze and petty crime. 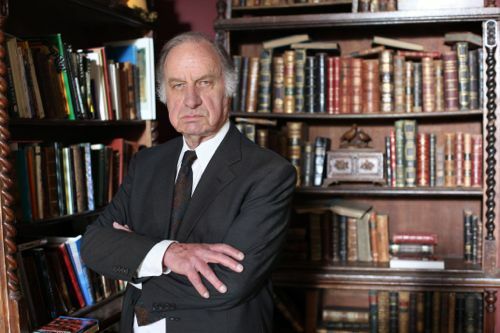 And Geoffrey Palmer’s Dr Clarence, whose once tidy home is now overflowing with books. Those familiar with Manchester and Salford will recognise many of the striking locations. Including a spot of fire juggling by Eddie outside Manchester Cathedral. While some may be moved to subsequently read The Happy Prince by Oscar Wilde, which also features in this rather wonderful film. As well as Lost Christmas – the novel by David Logan. It’s a TV drama not to be missed, also including the likes of Sorcha Cusack, Christine Bottomley, Steven Mackintosh, Connie Hyde, Brett Fancy, Adlyn Ross, Chloe Newsome, Jessie Clayton and Jason Watkins. Not forgetting young Libbi Rubens as Milly. Or some magical original music from Debbie Wiseman. My transcript of the BFI Q&A is below for those who want to read more. Edited to remove any potential spoilers. All eyes on Larry. 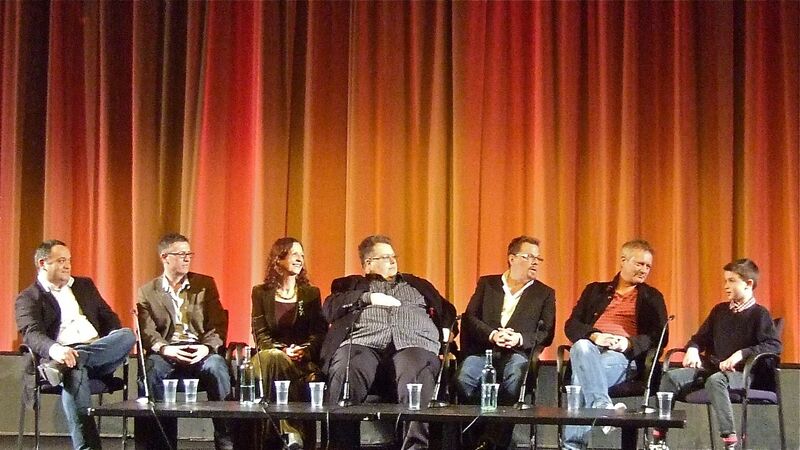 L-R: Writer David Logan, executive producers Connal Orton and Sue Nott, chair Justin Johnson, Eddie Izzard (Anthony), director John Hay and Larry Mills (Goose). Q: This felt really cinematic like a proper film? Q: Also plans for a theatrical release? Q: And this is the first public audience to see it? Q: How did you feel sitting out there and getting their reactions? Q: References to other films and stories? “Obviously we’d been talking about references of Scrooge and that was all there, and A Christmas Carol and second chances and redemption. I said, ‘It reminds me of one of my favourite Oscar Wilde stories, the story of The Happy Prince.’ It’s a story about a prince who dies and they make a statue of him. And as a statue he’s looking down on the town and he realises that all the people in his town are really poor and he’s really sad that he never realised that when he was alive. “And then a swallow comes. And the swallow is just about to go and migrate because it’s coming to winter and the prince says, ‘Please take some of these jewels and all this gold that’s on me and take it to help the poor people.’ So the swallow keeps taking more gold and more jewels from the statue until the statue is left completely bare and ugly. And the swallow sacrifices himself because he leaves it too late to migrate. Q: By CBBC – and BBC – standards, it’s an expensive production. Was that a big decision to make in terms of the money? Q: Larry – anybody watching the production would assume that you’ve got quite a lot of credits under your belt and that you’ve done a lot of TV and film. But that’s not the case, is it? Q: How did you prepare? Was it a very scary experience coming on set for the first time and having the cameras point at you? Geoffrey Palmer as Dr Clarence. Q: For a child role people normally audition thousands? “So she said that to me and I thought, ‘Oh great.’ Then I waited until they’d cast Horrid Henry and then I realised that they didn’t want anyone who had no experience. I’ve always used kids who have no experience from Thomas Sangster onwards, like Lewis McKenzie in Jimmy Grimble. I just love someobdy who is completely untrained because it just brings a freshness of approach. So I saw him. But I obviously had to pretend that I was seeing other people! Q: Eddie – the first family film you’ve actually been in? Eddie Izzard: “Yes. I see this as a film. It’s like if you look at Harry Potter. You could think it’s for kids but then it’s really for adults but kids can get into it – kids are going to miss some themes of loss because you just can’t really experience it. “But Larry and his family and me and my family have both gone through family loss. So that was a curious thing. I didn’t know how to broach that and get into it. I don’t know if we needed to. But it’s just in there. So this is the first time, yeah. But I consider it a dramatic film and I was just trying to touch the reality. Q: There are a few bits and pieces in there that make it perhaps not the normal CBBC commission – there’s a little bit of language and it is quite a bleak story. Was there any concern at CBBC about some of the content? Q: I asked John and Eddie about the experience of filming in Manchester and some of those striking locations. Q: Eddie – did you have a clear idea of how to play such an elusive character? Not knowing who he was? Hard to grasp? Eddie Izzard: “I realised he (Anthony) had no fear. Because he had no memory he didn’t know the consequences of those kids who were tagging (an early encounter in the film) – he has no fear. So he walks without fear and without memory and that’s interesting because you have this ethereal quality. 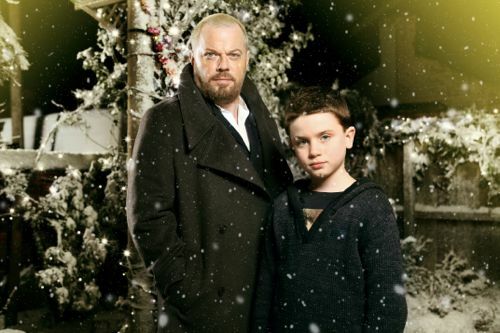 Posted in News and tagged Brett Fancy, CBBC, Chloe Newsome, Christine Bottomley, Connie Hyde, David Logan, Eddie Izzard, Geoffrey Palmer, Jason Flemyng, Jason Watkins, John Hay, Larry Mills, Lost Christmas, Sorcha Cusack, Steven Mackintosh, Sue Nott. Bookmark the permalink. Truly wonderful! All the elements of a fairy tale, but with real truths about compassion and despair and humanity and fear. Knew when I saw Eddie Izzard’s name I had to watch but the rest of the cast was superb too, especially Larry Mills. Just watched this & was blown away by it, it was amazing. Random question but do you know what breed of dog Mutt was?! Not a dog person, I’m afraid. Can anyone else help? I think it is a wire haired fox terrier, but that is only going on google images after just watching Lost Christmas and wondering the same thing that you were! I believe it was a cockapoo. Fantastic piece of television. Just what the BBC are good at. Eddie Izzard’s ‘aura’ was spot on to be able to play this part. A compelling story. what a fantastic christmas story well done beeb!!!!!!!!!!!!!!!!! At last the BBC back to its best doing what it does so well, i was extremely transfixed for the whole of the 90 minutes, superb acting and a very well done to all involved. A great xmas present, thankyou. Spellbinding. Eddie Izzard is an angel. More synchronicity than you could imagine. So lovely to see Geoffrey Palmer. I’d been told he was dead. Worked with him once on As Time Goes By. A gentle man, a gentleman and a totally inspiring actor. I enjoyed this so much on many levels. So cleverly plotted. Such wonderful surprises right to the end. Everything is possible. Thank you. I was sobbing like a baby… Truly poetic heartwarming wonderful Christmas story… BBC at it’s best. I loved every minute of it. Thanks for the info and chance to echo the pleasure this show gave my family – a truly magical Xmas story on a par with Wonderful Life and Christmas Carol. Ruing my failure to set it to tape so will watch again on CBBC on Xmas Eve – if only to to appreciate more fully the genius! Maggie – do you mean the Tom McCrae song? See my reply to David above. we want the theme song. “a perfect kind of christmas” any ideas ? not the mcrae version. Thought provoking and intense. Loved every minute of it from the laughs to the tears, of which there were many. Eddie Izzard and the rest of the cast were superb. If the beeb keep this kind of programming up I won’t mind paying the licence fee at all. 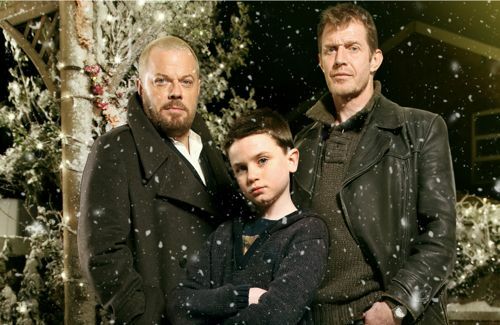 I have just watched Lost Christmas on the iPlayer, and thought it was truly wonderful television. Thank you to all concerned. Thanks too to Ian for letting us know that Wonderful Christmastime was by Tom Mcrae, but does anyone have any idea where I can buy it from? I can’t see it on his website that Ian provided a link to, and I think Tom has missed a treat by not having it on amazon.co.uk or on iTunes. I found it on amazon.com, but you cannot download US mp3s to the UK. Anyone any ideas? I look forward to enjoying this again & again & again and it would be nice if the beeb repeats it every Christmas so that future generations can experience it for themselves. Absolutely brilliant, wonderful acting, great story line! One of the best tv moments I’ve had watching the BBC this year. Some stories pierce our hearts and open our eyes. This is one such tale. Thank you so much for blogging about Lost Christmas, Ian. Just reading this brought it all back to me and tears fell again. That was just wonderful Television. If only I could get BBC iplayer so I could watch it again. Thanks for posting who sang the ending song too. Pleased I wasn’t the only bloke blubbering with his wife. The best TV I have see in years, tucked away quietly in the Sunday afternoon schedules, though we had SKY+ it. Should be shown peak-time BBC1 Christmas Eve – a real treasure. Thank you to all concerned in making it. Thanks Ian, I wouldn’t have picked out this wonderful drama if I hadn’t read your article. The whole idea of one simple action having a profound knock-on affect on ourselves and others has always fascinated me and this story didn’t disappoint. I was a blubbering idiot by the end too!! Great acting all round, (Eddie Izzard is always a dream) and the Beeb at its best. TELLING EVERYONE ABOUT THIS FANTASIC DRAMA, HAVE RECORDED IT FOR PEOPLE TO COME AND WATCH, CRIED AND SMILED ALL THE WAY THROUGH. I DONT WATCH A LOT OF TELE BUT THIS WAS SOOOOOO WORTH IT. LOVED IT WHAT A STORY. I have never seen such a clever, magical, touching, thought provoking film in all my life. I was completely glued to it! Well done to everyone involved, I thought it was absolutely fantastic. Accidently fell across this on Sunday and I am so glad I did. What a brilliant story, superbly acted. Love Eddy Izzard in anything and it was seeing him that stopped me channel surfing. Have told friends all about it and so pleased it’s being re-shown on Christmas Eve as I missed the start. Many Sky + boxes will be whirring into life at 5.30pm on Saturday. I want to buy this on DVD when is it out???? Don’t have any firm DVD release info yet, Sharon. Has anyone else seen anything? I believe the DVD version will be the same “full edit” cinematic release that we saw at the BFI. Oh wow, just watched it – well done everyone, especially Eddie Izzard for providing the pathos. Also I now love the song Wonderful Christmastime – Tom McRae’s version is fantastic. Well worth the licence fee just for this! I’m not sure the DVD is actually available to rent yet at Tesco, Rachael? It says the release date is TBC (To Be Confirmed) on their site. Is this the beginning of a new series, based on Izzard’s character, with a new cast each time ? It was a one-off film, Garry. No plans for more. Absolutely brilliant, both script and cast were superb. One of the best Christmas tv shows/films I’ve seen in a long time. Props to everyone. I quite enjoyed it, but fond the ‘lightbulb’ error irritating and distracting – it wasn’t invented by Edison, but by by Joseph Swann. Not legally Shai. I believe it will be screened in the USA in 2012. Just watched the film and loved it. Like another person said, I tuned in because of Eddie Izzard but enjoyed the entire film. The movie requires significant suspension of disbelief and there a several obvious plot holes but the production is so well done and the piece so well acted, it is easy to overlook any flaws. Definitely a Christmas classic! Really random question (aside from utter praise for this production) anyone any idea where the wallpaper from in the drowned girls parents bedroom. Many thanks if you do! desperate to know this too. really hope someone will come back to us with the answer!! Such a great programme. enjoyed every character and story! Found it! Paper by Sara palmer. You can source it on website wallpaperking but it’s made by a company in Barcelona if you want to go direct. Very happy! J Meehan – thank you! & well done – I have been searching for what feels like years. Very happy indeed! Jason – see the replies above. I’m sure there will be a DVD in due course but that may have to wait until after a planned cinematic release as discussed in the Q&A. Will do my best to get more official info when the BBC are back in the office after the New Year break. Why wasn’t this superb film put on prime time TV either close to or actually on Christmas Day? Stumbled across it on iPlayer and am sure that many who would have loved it have missed it. Just watched this, as I cancelled Christmas this time round. Did not really fancy it, but it was really well filmed, with good characters, great use of location, and to top it all a great story. I reckon that it will become as popular as some of the Dickens films that we have on every Christmas. excellent viewing is dvd coming? Hi – I did reply to this last weekend but for some strange reason it did not appear here. Sorry! Debbie Wiseman is the composer but, like you, I can’t find any trace of an audio release – either via CD or iTunes etc. Does anyone else know different? Suppose there’s always a hope that Debbie may make the music available at a later date. Will keep an eye out. Thank you very much Ian!!! watched this boxing day morning, it got me hooked from the beginning, amazing story line and great acting. this should be watched.